Enter a world where you are revered by everyone you know and be idolized by thousands of screaming fans. Click here to play! Fame and Fortune will lead you down a path of high status and most importantly big money. Let the Glamour Girl lead you through the ins and outs of being a big celebrity. She only appears on selected reels, but she substitutes for other symbols and doubles the prize on any winning combination. If you can spin five Hollywood signs you'll get 2500 times your original line bet. Fancy cars pay out up to 1500 times your wager, and golden statues pay out 1000 times your wager. Of course, it wouldn't be Hollywood without diamonds and stars on the walk of fame. Keep an eye out for these icons as well, because they'll help you in your pursuit of the ultimate fortune. The Fame and Fortune stars will award you with bonuses if you're lucky enough to spin them on reels 1 and 5. You'll be rewarded with free games in which prizes are doubled during the first five spins and tripled in the last five. Diamonds will also trigger free games. Everything you need to achieve Fame and Fortune is there. All you have to do is spin the reels for a chance at the ultimate lifestyle. Diamonds and Fame and Fortune Stars act as scatter icons. Any two fame and fortune stars will multiply your total bet. These will also award you with free games in which prizes are doubled and tripled. A Fame on reel 1 and a Fortune on reel 5 wins you 10 free games. 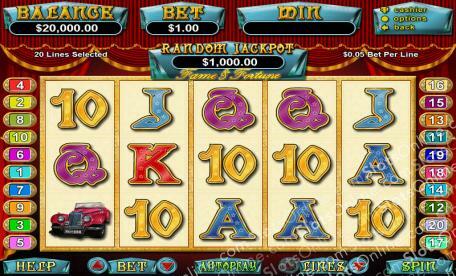 Diamonds are added to the reels during these free games. Speaking of diamonds, three or more anywhere on the board will give you 10 free games as well. The Glamour Girl decked out in fur is the substitue symbol. She will replace all other symbols excluding scatters. The prize is doubled when the Glamour Girl appears in a winning combination.